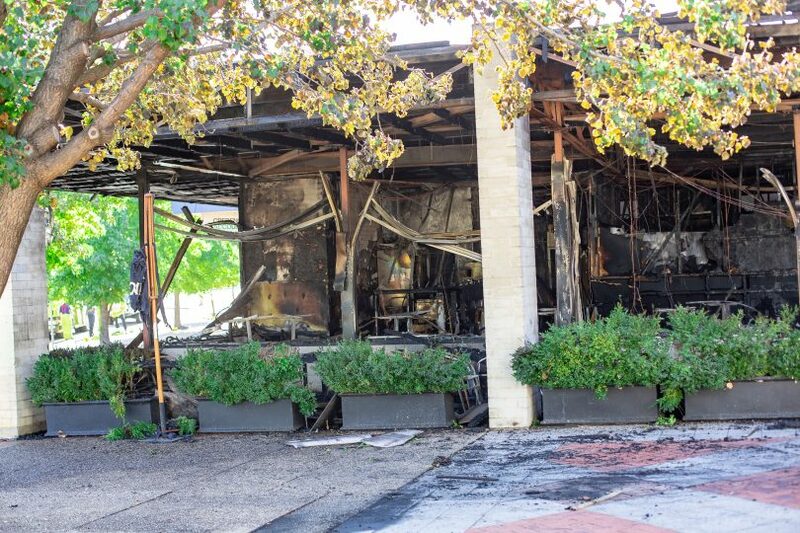 Fire gutted the Olive at Mawson restaurant early today, and is being treated as suspicious. Photo: George Tsotsos. 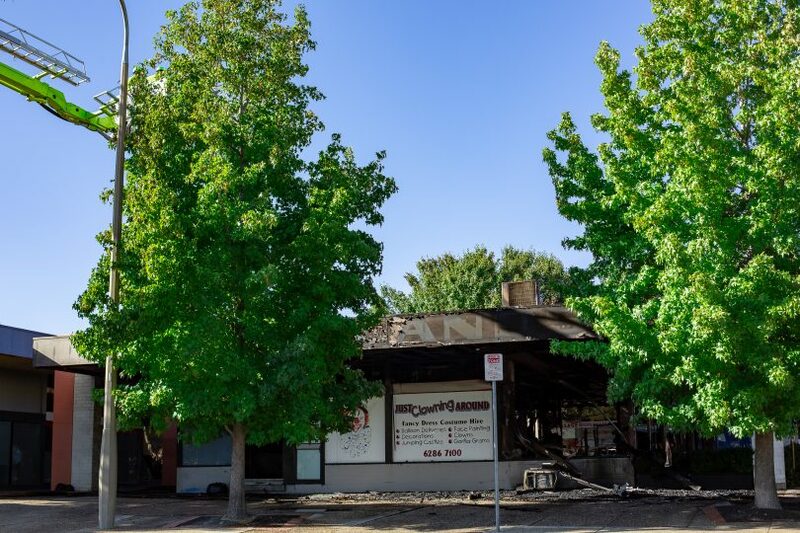 The owners of two restaurants on opposite sides of Canberra that appear to be the target of arson attacks early today are mystified as to who would be behind the fires but have vowed to rebuild. 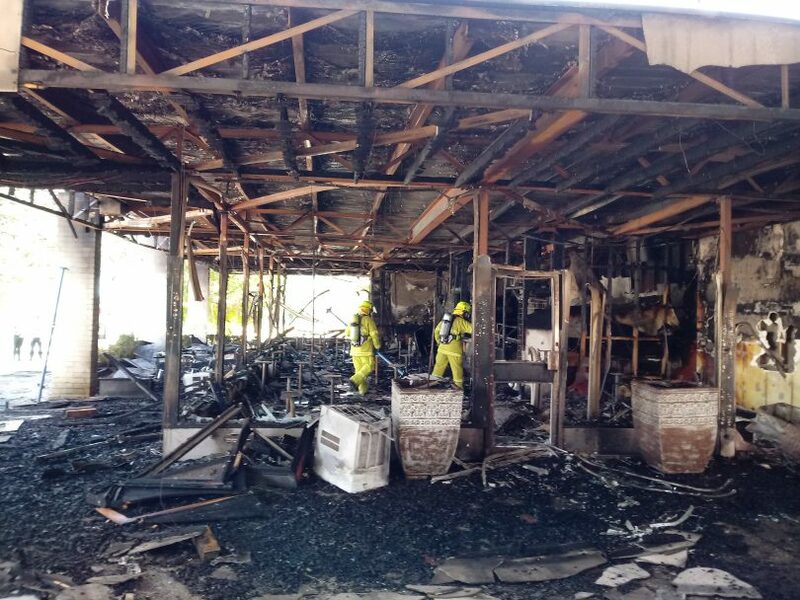 Fire destroyed the family-owned Olive at Mawson at Southlands Shopping Centre while its sister restaurant Olive at Hawker escaped with about $100,000 damage after a passerby alerted ACT Fire and Rescue soon after midnight and partially extinguished the blaze before firefighters arrived to complete the job. Fire and Rescue had responded to 000 calls from the Mawson fire about 12.45am with four pumpers, an aerial appliance, and a hazmat vehicle. Firefighters in breathing apparatus took a couple of hours to bring the rapidly developing blaze belching hazardous smoke under control and prevent it spreading to nearby businesses. Commander of southside operations Sam Evans said both fires were now being treated as suspicious and the investigation had been handed over to police. Firefighters were still on site examining the structural integrity of the building. Devastated owner Dimitri Yianoulakis at the Mawson site. Photo: Ian Bushnell. Co-owner Dimitri Yianoulakis, who was at the Mawson site this morning, said the fires had devastated the family. “It’s shattered us,” he said. He said clear CCTV footage at Hawker, which had been provided to police, showed the fire there had been deliberately lit but he had not been able to look at the Mawson footage. “We have no idea why it happened. We’re given much love from the community, we give back to the community, the outpouring on social media has been fantastic, and for someone to come and do this is devastating,” he said. Mr Yianoulakis said the family would definitely rebuild although he did not know how at Mawson, given the significant structural damage there. He said the business was flourishing and the family had hoped to expand to Gungahlin but the fires had put a brake on those plans. “We’re not stopping, we were expanding , we weren’t going backwards, we were going forward,” he said. Mr Yianoulakis thanked the passerby whose efforts had saved the Hawker restaurant from more damage. “I’d like to than that member of the public. He actually alerted the fire brigade and use a bucket or a hose to put out the fire at the back of the restaurant which saved a lot of damage,” he said. Mr Yianoulakis said the family would incur a loss of income but their staff and the community they served would also suffer. “It’s our staff we support, the community that we support, everybody suffers, people that have made pre-bookings, christenings, they all suffer because they have to find new venues, that’s what upsets us,” he said. 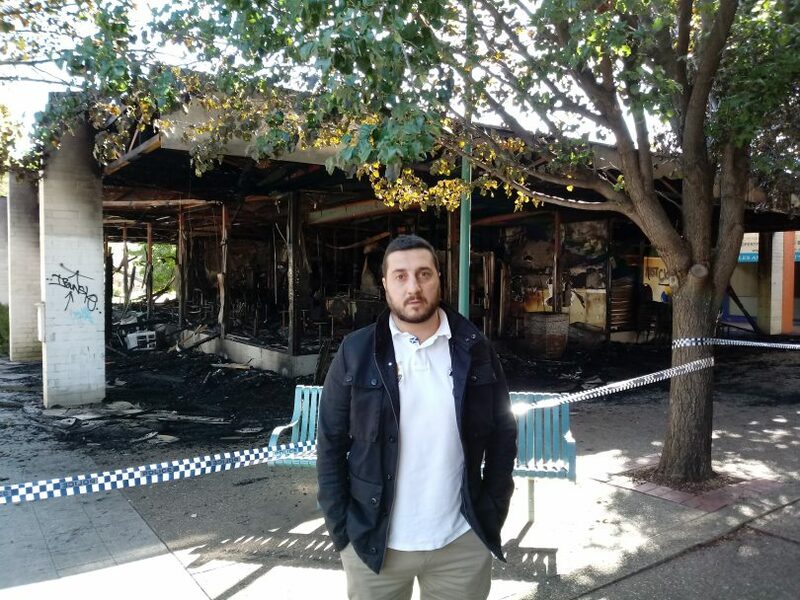 Mr Yianoulakis hoped the authorities came down hard on the perpetrators, pointing to other acts of arson across Canberra. “I hope justice prevails. I really hope that they come down hard, it’s not just this, it’s numerous cars [set alight] all around Canberra. It’s disgusting, something needs to be done,” he said. Olive at Mawson had been open about six years while the Hawker restaurant had been going for more than two years. Such a shame! Have eaten at Mawson, and enjoyed very much! Thoughts going out to the family . If we can assist you in anyway please reach out . Tina Kambouris is this where you work?? Ashley Rose no, but Olivia worked there. It was such a nice restaurant! Jim's birthday last year-fantastic hosts and food,very memorable. Had a lovely meal, great hosts that spoiled our kids. Yes it was and a very good one too. This is terrible. Why would anyone do this? Did you have smoke at your place Kym? This is the first I’m hearing about it. The dogs didn’t wake us up except Pickles did bark early this morning but that’s not unusual for her.